Nintendo Entertainment System (often referred to as NES or simply Nintendo), is an 8-bit video game console released by Nintendo in North America, Brazil, Europe, Asia, and Australia in 1985. Its Japanese equivalent is known as the Nintendo Family Computer (ファミリーコンピューター, Famirī Kompyūtā ?) or Famicom (ファミコン, Famikon ?). The most successful gaming console of its time in Asia and North America (Nintendo claims to have sold over 60 million NES units worldwide), it helped revitalize the video game industry following the video game crash of 1983, and set the standard for subsequent consoles in everything from game design (the breakthrough platform game, Super Mario Bros., was the system’s first " killer app") to business practices. The NES was the first console for which the manufacturer openly courted third-party developers. Following a series of arcade game successes in the early 1980s, Nintendo made plans to produce a cartridge-based console. Masayuki Uemura designed the system, which was released in Japan on July 15, 1983 for ¥14,800 alongside three ports of Nintendo's successful arcade games Donkey Kong, Donkey Kong Jr., and Popeye. The Nintendo Family Computer (Famicom) was slow to gather momentum: during its first year, many criticized the system as unreliable, prone to programming errors and rampant freezing. Following a product recall and a reissue with a new motherboard, the Famicom’s popularity soared, becoming the best-selling game console in Japan by the end of 1984. Encouraged by its successes, Nintendo soon turned its attentions to the North American market. Nintendo entered into negotiations with Atari to release the Famicom under Atari’s name as the name "Nintendo Enhanced Video System." This deal eventually fell through. Subsequent plans to market a Famicom console in North America featuring a keyboard, cassette data recorder, wireless joystick controller, and a special BASIC cartridge under the name "Nintendo Advanced Video System" likewise never materialized. Finally, in June 1985 Nintendo unveiled its American version of the Famicom at the Consumer Electronics Show (CES). Nintendo rolled out its first systems to limited American markets on October 18, 1985, following up with a full-fledged North American release of the console in February of the following year. Nintendo simultaneously released eighteen launch titles: 10-Yard Fight, Baseball, Clu Clu Land, Donkey Kong Jr. Math, Duck Hunt, Excitebike, Golf, Gyromite, Hogan's Alley, Ice Climber, Kung Fu, Mach Rider, Pinball, Stack-Up, Super Mario Bros., Tennis, Wild Gunman, and Wrecking Crew. In Europe and Australia, the system was released to two separate marketing regions (A and B). Distribution in region B, consisting of most of mainland Europe (excluding Italy), was handled by a number of different companies, with Nintendo responsible for most cartridge releases; most of region B saw a 1986 release. Mattel handled distribution for region A, consisting of the United Kingdom, Ireland, Italy, Australia and New Zealand, starting the following year. Not until 1990 did Nintendo's newly created European branch take over distribution throughout Europe. Despite the system's lackluster performance outside of Japan and North America, by 1990 the NES had become the best-selling console in video game history. As the 1990s dawned, however, renewed competition from technologically superior systems such as the 16-bit Sega Mega Drive (known as the Sega Genesis in North America) marked the end of the NES’s dominance. Eclipsed by Nintendo’s own Super Nintendo Entertainment System (SNES), the NES’s user base gradually waned. Nintendo continued to support the system in America through the first half of the decade, even releasing a new version of the console, the NES 2, to address many of the design flaws in the original NES hardware. By 1995, though, in the wake of ever decreasing sales and the lack of new software titles, Nintendo of America officially discontinued the NES. Despite this, Nintendo of Japan kept producing new Nintendo Famicoms for a niche market up until October 2003, when Nintendo of Japan officially discontinued the line. Even as developers ceased production for the NES, a number of high-profile video game franchises and series for the NES were transitioned to newer consoles and remain popular to this day. Nintendo's own Super Mario Bros., The Legend of Zelda, and Metroid franchises debuted on the NES, as did Capcom's Mega Man franchise, Konami's Castlevania franchise, and Square Enix's Final Fantasy and Dragon Quest franchises. In the years following the official "death" of the NES in the West, a collector’s market based around video rental shops, garage sales and flea markets led some gamers to rediscover the NES. Coupled with the growth of console emulation, the late 1990s saw something of a second golden age for the NES. The secondhand market began to dry up after 2000, and finding ROMs no longer represented the challenge it had in the past. Parallel to the rise of interest in emulation was the emergence of a dedicated NES hardware "modding" scene. Such hobbyists perform tasks such as moving the NES to a completely new case, or just dissecting it for parts or fun. The controllers are particular targets for modding, often being adapted to connect with personal computers by way of a parallel or USB port. Some NES modders have transformed the console into a portable system by adding AA batteries and an LED or LCD screen. For its North American release, the NES was released in two different configurations, or "bundles." The console deck itself was identical, but each bundle was packaged with different Game Paks and accessories. The first of these sets, the Control Deck, retailed from US$199.99, and included the console itself, two game controllers, and a Super Mario Bros. game pak. The second bundle, the Deluxe Set, retailed for $249.99 and consisted of the console, a R.O.B., a NES Zapper, and two game paks: Duck Hunt and Gyromite. For the remainder of the NES's commercial lifespan in North America, Nintendo frequently repackaged the console in new configurations to capitalize on newer accessories or popular game titles. Subsequent bundle packages included the NES Action Set, released in November 1988 for $199.99, which replaced both of the earlier two sets, and included the console, the NES Zapper, two game controllers, and a multicart version of Super Mario Bros. and Duck Hunt. The Action Set became the most successful of the packages released by Nintendo. One month later, in December 1988, to coincide with the release of the Power Pad floor mat controller, Nintendo released a new Power Set bundle, consisting of the console, the Power Pad, the NES Zapper, two controllers, and a multicart containing Super Mario Bros., Duck Hunt, and World Class Track Meet. In 1990, a Sports Set bundle was released, including the console, an NES Satellite infrared wireless multitap adaptor, four game controllers, and a multicart featuring Super Spike V'Ball and Nintendo World Cup. Two more bundle packages were released using the original model NES console. The Challenge Set, included the console, two controllers, and a Super Mario Bros. 3 game pak. The Basic Set, first released in 1987, included only the console and two controllers with no pack-in cartridge. Instead, it contained a book called the The Official Nintendo Players Guide, which contained detailed information for every NES game made up to that point. Finally, the redesigned NES 2 was released as part of the final Nintendo-released bundle package, once again under the name Control Deck, including the new style NES 2 console, and two redesigned "dogbone" game controllers. Released in October 1993, this final bundle retailed for $49.99, and remained in production until the discontinuation of the NES in 1995. Different case design. The Famicom featured a top-loading cartridge slot, a 15- pin expansion port located on the unit’s front panel for accessories (as the controllers were hard-wired to the back of the console), and a red and white colour scheme. The NES featured a front-loading cartridge slot (often jokingly compared to a toaster), and a more subdued gray, black and red colour scheme. An expansion port was found on the bottom of the unit, and the cartridge connector pinout was changed. 60-pin vs. 72-pin cartridges. The original Famicom and the re-released AV Family Computer both utilized a 60-pin cartridge design, which resulted in smaller cartridges than the NES (and the NES 2), which utilized a 72-pin design. Four pins were used for the 10NES lockout chip. Ten pins were added that connected a cartridge directly to the expansion port on the bottom of the unit. Finally, two pins that allowed cartridges to provide their own sound expansion chips were removed, a regrettable decision. Many early games (such as StackUp) released in North America were simply Famicom cartridges attached to an adapter (such as the T89 Cartridge Converter) to allow them to fit inside the NES hardware. Nintendo did this to reduce costs and inventory by using the same cartridge boards in America and Japan. Famicom Disk System (FDS). Although not included with the original system, a popular floppy disk drive peripheral was released for the Famicom in Japan only. Nintendo never released the Famicom Disk System outside of Japan, citing concerns about software bootlegging. Notable games released for the FDS include Doki Doki Panic, a special edition of Metroid, and the original Super Mario Bros. 2. Famicom BASIC was an implementation of BASIC for the Famicom. It allowed the user to program his or her own games. Many programmers got their first experience on programming for the console this way. Famicom MODEM was a modem that allowed connection to a Nintendo server which provided content such as jokes, news (mainly about Nintendo), game tips, weather reports for Japan and allowed a small number of programs to be downloaded. External sound chips. The Famicom had two cartridge pins that allowed cartridges to provide external sound enhancements. They were originally intended to facilitate the Famicom Disk System’s external sound chip. These pins were removed from the cartridge port of the NES, and relocated to the bottom expansion port. As a result, individual cartridges could not make use of this functionality, and many NES localizations suffered from inferior sound compared to their equivalent Famicom versions. Castlevania III: Dracula’s Curse is a notable example of this problem. Hardwired controllers. The Famicom’s original design includes hardwired, non-removable controllers. In addition, the second controller featured an internal microphone for use with certain games. Both the controllers and the microphone were subsequently dropped from the redesigned AV Famicom in favour of the two seven-pin controller ports on the front panel used in the NES from its inception. Lockout circuitry. The Famicom contained no lockout hardware, and, as a result, unlicensed cartridges (both legitimate and bootleg) were extremely common throughout Japan and the Far East. The original NES (but not the top-loading NES 2) contained the 10NES lockout chip, which significantly increased the challenges faced by unlicensed developers. Tinkerers at home in later years discovered that disassembling the NES and cutting the fourth pin of the lockout chip (a process now legal with the expiration of the NES patent) would cut power to the chip, removing all effects and greatly improving the console’s ability to play legal games, as well as bootlegs and converted imports. The European release of the console used a regional lockout system that prevented cartridges released in region A from being played on region B consoles, and vice versa. Audio/video output. The original Famicom featured an RF modulator plug for audio/video output, while the original NES featured both an RF modulator and RCA composite output cables. The AV Famicom featured only RCA composite output, and the top-loading NES featured only RF modulator output. The game controller used for the both the NES and Famicom featured a brick-like design with a simple four button layout: two round buttons labelled "B" and "A," a "Start" button, and a "Select" button. Additionally, the controllers utilized the cross-shaped D-pad, designed by Nintendo employee Gunpei Yokoi for Nintendo Game & Watch systems, to replace the bulkier joysticks on earlier gaming consoles' controllers. Famicom controllers were simple in design, though they included a number of features, such as a microphone, missing from their NES counterparts. The original model Famicom featured two game controllers, both of which were hardwired to the back of the console. The second controller lacked the "Start" and "Select" buttons, but featured a small microphone. Relatively few games made use of this feature. The earliest produced Famicom units initially had squared A and B buttons. This was changed to the circular designs because of the square buttons being caught in the controller casing when pressed down. The NES dropped the hardwired controllers, instead featuring two custom 7-pin ports on the front of the console. Also in contrast to the Famicom, the controllers included with the NES were identical to each other—the second controller lacked the microphone that was present on the Famicom model, and possessed the same "Start" and "Select" buttons as the primary controller. 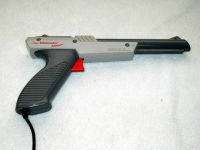 Although it was supported only by a few select titles, the Zapper was arguably the most popular special controller released for the NES. A number of special controllers designed for use with specific games were released for the system, though very few such devices proved particularly popular. Such devices included, but were not limited to, the NES Zapper (a light gun), the Power Pad, and the ill-fated R.O.B. and Power Glove. The original Famicom featured a deepened DA-15 expansion port on the front of the unit, which was used to connect most auxiliary devices. On the NES, these special controllers were generally connected to one of the two control ports on the front of the unit. Near the end of the NES’s lifespan, upon the release of the AV Famicom and the top-loading NES 2, the design of the game controllers was modified slightly. Though the original button layout was retained, the redesigned device abandoned the "brick" shell in favor of a "dog bone" shape reminiscent of the controllers of the Super Nintendo Entertainment System. In addition, the AV Famicom joined its international counterpart and dropped the hardwired controllers in favour of detachable controller ports. However, the controllers included with the Famicom AV, despite being the "dog bone" type, had cables which were a short three feet long, as opposed to the standard six feet of NES controllers. In recent years the original NES controller has become one of the most recognizable symbols of the system. Nintendo has mimicked the look of the controller in several recent products, from promotional merchandise to limited edition versions of the Game Boy Advance SP and Game Boy Micro handheld game consoles. When Nintendo released the NES in the United States, the design styling was deliberately different from that of other game consoles. Nintendo wanted to distinguish its product from those of competitors, and to avoid the generally poor reputation that game consoles had acquired following the video game crash of 1983. One result of this philosophy was a front-loading zero insertion force (ZIF) cartridge socket designed to resemble the front-loading mechanism of a VCR. The ZIF connector worked quite well when both the connector and the cartridges were clean and the pins on the connector were new. Unfortunately, the ZIF connector was not truly zero insertion force. When a user inserted the cartridge into the NES, the force of pressing the cartridge down and into place bent the contact pins slightly, as well as pressing the cartridge’s ROM board back into the cartridge itself. Repeated insertion and removal of cartridges caused the pins to wear out relatively quickly, and the ZIF design proved far more prone to interference by dirt and dust than an industry-standard card edge connector. Exacerbating the problem was Nintendo’s choice of materials; the slot connector that the cartridge was actually inserted into was made of a cheap alloy that was highly prone to corrosion. Add-on peripherals like the popular Game Genie cheat cartridge tended to further exacerbate this problem by bending the front-loading mechanism during gameplay. Problems with the 10NES lockout chip frequently resulted in the system’s most infamous problem: the blinking red power light, in which the system appears to turn itself on and off repeatedly. The lockout chip was quite finicky, requiring precise timing in order to permit the system to boot. Dirty, aging, and bent connectors would often disrupt the timing, resulting in the blink effect. User attempts to solve this problem ranged from blowing air onto the cartridge connectors to slapping the side of the system after inserting a cartridge. Many of the most frequent attempts to fix this problem ran the risk of damaging the cartridge and/or system. Blowing on the cartridge connectors was, in most cases, no better than removing and reinserting the cartridge, and tended to increase the rate of oxidation resulting in browning of the printed circuit board, while slapping the side of the system after inserting the cartridge could potentially damage the console. 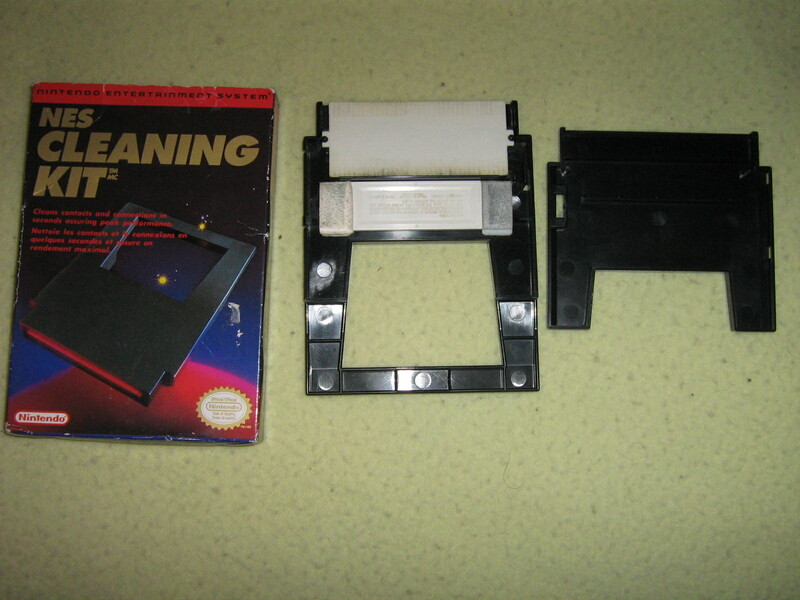 In 1989, Nintendo released an official NES Cleaning Kit to help users clean malfunctioning cartridges and consoles. A more successful technique used to keep the contact pins properly aligned was to load the game cartridge as shallowly as possible into the NES, so that the back of the cartridge would scrape the inside of the NES as it was pushed down into place. This would often allow the game to be initialized more successfully than simply sliding the cartridge all the way in. It is also possible to open the system and physically bend the contacts beyond their original placement, allowing a more secure contact between the pins and the cartridge. With the release of the top-loading NES 2 toward the end of the NES’s lifespan, Nintendo resolved the problems by switching to a standard card edge connector, and eliminating the lockout chip. All of the Famicom systems used standard card edge connectors, as did Nintendo’s subsequent game consoles, the Super Nintendo Entertainment System and the Nintendo 64 (the company's last cartridge-based game console). In response to these hardware flaws, "Nintendo Authorized Repair Centers" sprang up across the United States. According to Nintendo, the authorization program was designed to ensure that the machines were properly repaired. Nintendo would ship the necessary replacement parts only to shops that had enrolled in the authorization program. In practice, the authorization process consisted of nothing more than paying a fee to Nintendo for the privilege. Nintendo’s near monopoly on the home video game market left it with a degree of influence over the industry exceeding even that of Atari during its heyday in the early 1980s. Many of Nintendo’s business practices during this period were heavily criticized, and may have played some role in the erosion of Nintendo’s market share throughout the 1990s. Unlike Atari, who never actively courted third-party developers, and went so far as to go to court to attempt to force Activision to cease production of Atari 2600 games, Nintendo had anticipated and encouraged the involvement of third-party software developers—but strictly on Nintendo’s terms. To this end, a 10NES authentication chip was placed in every console, and in every officially licensed cartridge. If the console’s chip could not detect a counterpart chip inside the cartridge, the game would not be loaded. Nintendo combined this with a marketing campaign introducing the Nintendo Seal of Quality. Commercials featured a purple-robed wizard instructing consumers that the Nintendo Seal of Quality was the only assurance that a game was any good—and, by implication, that any game without the Seal of Quality was bad. In reality, the seal only meant that the developer had paid the license fee; it had nothing to do with the quality of the game. The business side of this was that game developers were now forced to pay a license fee to Nintendo, to submit to Nintendo’s quality assurance process, to buy developer kits from Nintendo, and to utilize Nintendo as the manufacturer for all cartridges and packaging. Nintendo tested and manufactured all games at its own facilities (either for part of the fee or for an additional cost), reserved the right to dictate pricing, censored material it believed to be unacceptable, decided how many cartridges of each game it would manufacture, and placed limits on how many titles it would permit a publisher to produce over a given time span (five per year). This last restriction led several publishers to establish or utilize subsidiaries to circumvent Nintendo’s policies (examples including Konami’s subsidiary Ultra, and Acclaim Entertainment’s subsidiary LJN). These practices were intended not only to keep developers on a short leash, but also to manipulate the market itself: in 1988, Nintendo started orchestrating intentional game shortages in order to increase consumer demand. Referred as "inventory management" by Nintendo of America public relations executive Peter Main, Nintendo would refuse to fill all retailer orders. Retailers, many of whom derived a large percentage of their profit from sales of Nintendo-based hardware and software (at one point, Toys "R" Us reported 17% of its sales and 22% of its profits were from Nintendo merchandise), could do little to stop these practices. In 1988, over 33 million NES cartridges were sold in the United States, but estimates suggest that the realistic demand was closer to 45 million. Because Nintendo controlled the production of all cartridges, it was able to enforce these rules on its third-party developers. These extremely restricted production runs would end up damaging several smaller software developers: even if demand for their games was high, they could only produce as much profit as Nintendo allowed. Several companies began producing unlicensed games, either refusing to pay the licensing fee or manufacturing their own cartridges after having been rejected by Nintendo. Most of these companies created circuits that used a voltage spike to knock out the authentication unit in the NES. Atari Games created a line of NES products under the name Tengen, and took a different tack: the company obtained a description of the lockout chip from the United States Patent and Trademark Office by falsely claiming that it was required to defend against present infringement claims in a legal case. Tengen then used these documents to design its Rabbit chip, which duplicated the function of the 10NES. Nintendo sued Tengen for these actions, and Tengen lost because of the fraudulent use of the published patent. Tengen’s antitrust claims against Nintendo were never finally decided. A few unlicensed games released in Europe and Australia came in the form of a dongle that would be connected to a licensed game, in order to use the licensed game’s 10NES lockout chip for authentication. Although Nintendo’s success at suing such companies was mixed (the case of Lewis Galoob Toys, Inc. v. Nintendo of America, Inc. was found in favour of Galoob and its Game Genie device, for instance), most were eventually forced out of business or out of production by legal fees and court costs for extended lawsuits brought by Nintendo against the companies. One notable exception was Colour Dreams, who produced Christian video games under the subsidiary name Wisdom Tree. This operation was never sued by Nintendo, who feared a public relations backlash. Following the introduction of the Sega Mega Drive, Nintendo began to face real competition in the industry, and in the early 1990s was forced to reevaluate its stance towards its developers, many of whom had begun to defect to other systems. When the console was reissued as the NES 2, the 10NES chip was omitted from the console, marking the end of Nintendo’s most notorious hold over its third-party developers. A thriving market of unlicensed NES hardware clones emerged during the heyday of the console’s popularity. Initially, such clones were popular in markets where Nintendo never issued a legitimate version of the system. In particular, the Dendy (Russian: Денди), an unlicensed hardware clone produced in Russia and other nations of the former Soviet Union, emerged as the most popular video game console of its time in that setting, and enjoyed a degree of fame roughly equivalent to the that experienced by the NES/Famicom in North America and Japan. The unlicensed clone market has persisted, and even flourished, following Nintendo’s discontinuation of the NES. As the NES fades into memory, many such systems have adopted case designs which mimic more recent game consoles. NES clones resembling the Sega Genesis, the Super Nintendo Entertainment System, and even current systems like the Nintendo GameCube, the Sony PlayStation 2 and the Microsoft Xbox have been produced. Some of the more exotic of these systems have gone beyond the functionality of the original hardware, and have included variations such as a portable system with a colour LCD (e.g. Pocket Famicom). Others have been produced with certain specialized markets in mind, including various "educational computer packages" which include copies of some of the NES’s educational titles and come complete with a clone of the Famicom BASIC keyboard, transforming the system into a rather primitive personal computer. As was the case with unlicensed software titles, Nintendo has typically gone to the courts to prohibit the manufacture and sale of unlicensed cloned hardware. Many of the clone vendors have included built-in copies of licensed Nintendo software, which constitutes copyright infringement in most countries. As recently as 2004, Nintendo of America has filed suits against manufacturers of the Power Player Super Joy III, an NES clone system that had been sold in North America, Europe, and Australia. Although most hardware clones were not produced under license by Nintendo, one exception is the Twin Famicom, produced by Sharp Corporation. The Twin Famicom was compatible with both Famicom cartridges and Famicom Disk System disks. It was available in two colors (red and black) and used similar hardwired controllers to the original Famicom, but featured a different case design. 2 pulse-wave channels, variable duty cycle (25%, 50%, 75%, 87.5%), 16-level volume control, hardware pitch-bend support, supporting frequencies from 54 Hz to 28 kHz. 1 delta pulse-code modulation (DPCM) channel with 6 bits of range, using 1-bit delta encoding at 16 preprogrammed sample rates from 4.2 kHz to 33.5 kHz, also capable of playing standard PCM sound by writing individual 7-bit values at timed intervals. Palette: 48 colors and 5 grays in base palette; red, green, and blue can be individually darkened at specific screen regions using carefully timed code. Display resolution: 256×240 pixels, though NTSC games usually used only 256×224, as the top and bottom 8 scanlines are not visible on most television sets (see overscan); for additional video memory bandwidth, it was possible to turn off the screen before the raster reached the very bottom. AV Famicom: Composite video output only, via a Nintendo proprietary 12-pin "multi out" connector first introduced for the Super Famicom/SNES. The NES had several limitations. The biggest was the number of sprites (moving objects) that could be on-screen at a time before a game's frame rate would begin to drop and sprite flickering would occur. Poorly programmed games (usually unlicensed games) could only have a single sprite on screen before flickering and even slowdown would occur. One of those games was Action 52, which had some of the worst performance on the NES due to the lack of quality programming and testing. This resulted in massive flicker, constant frame rate drops, and lock-ups. Games that were programmed and tested as best as possible usually had a smooth framerate, with very little flicker and few major glitches. R.C. Pro-Am, released in 1987, was one of those games.